Building on the Modelica solutions we have developed over the past 10 years, Claytex has created VeSyMA. 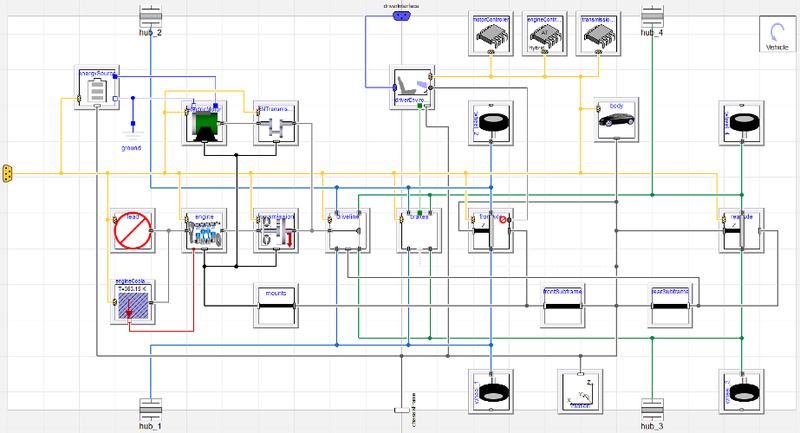 This is a new platform for Vehicle Systems Modelling and Analysis created using Modelica and available for Dymola. It is built on the open standard VehicleInterfaces model architecture from the Modelica Association and extends this to provide models for the simulation of conventional, hybrid, electric and novel automotive vehicles and race cars. The core VeSyMA Library enables the modelling of conventional, hybrid, electric and novel vehicles to predict their performance, fuel economy and energy usage. It includes experiments for straight line acceleration, drive cycles and gradeability tests. A set of common vehicle templates are provided but there is flexibility to allow the subsystems to be reconfigured to look at any vehicle architecture idea. Feel free to contact sales@claytex.com to get more information on the VeSyMA Library and the VeSyMA Extensions.